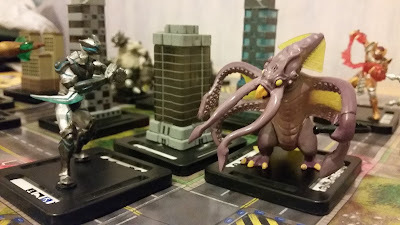 Its Kaiju vs Kaiju in this epic tabletop battle for the fate of the world! 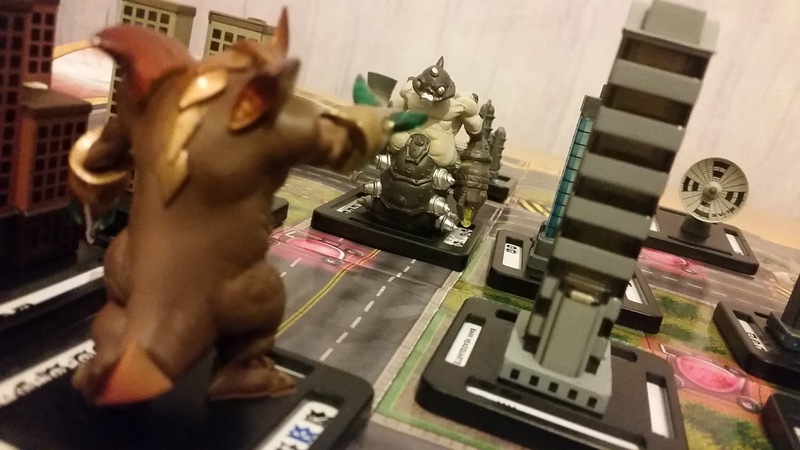 Taking control of a giant monster and its army of supporting tanks players pit themselves against each other, taking strategic points across the city to pave the way for their colossal beasts to lay a cataclysmic smack down. 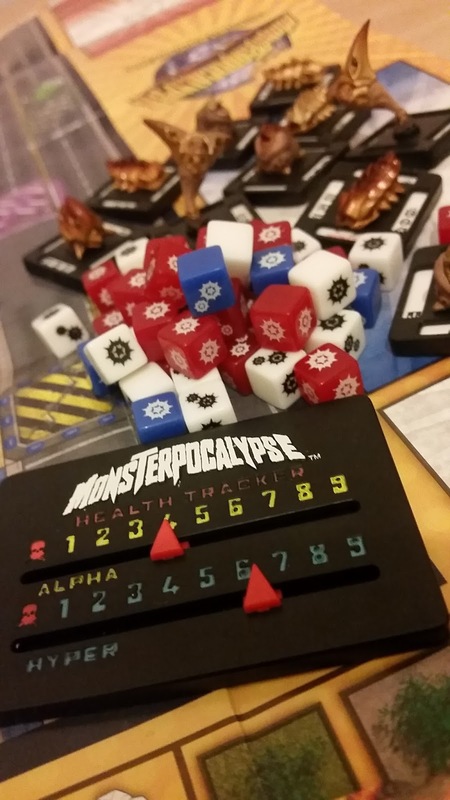 Monsterpocaplypse is a more traditional tabletop war game that requires players to move pieces across a city map and roll dice to determine how much damage they do to each other's army. Each player has a monster and an assignment of units that consists of tanks, aircraft, soldiers etc. Each monster and their unit belong to particular factions including subterranean mole creatures, robots, alien races and Lovecraftian fiends. Each player takes turns in moving their units using a massive pile of custom dice as currency. Each time you move or attack dice are spent by moving them from your unit pool into your monster pool. Units can attack each other, team up to attack monsters, attack buildings (which can either create hazards to block your enemies or yield specific rewards) or take control of strategic points. 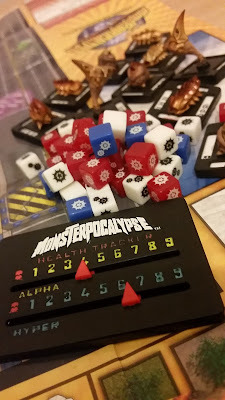 Once each player has spent all their dice it's time to move monsters, spending or rolling dice to manoeuvre around the battlefield or attack each other. Power dice earned during the unit round can be added to rolls to launch fun attacks, like head-butts and shockwaves, to add an additional level of fun. The game works very hard to mirror the joys of traditional Kaiju movies and it does just that. So cinematic is it that Tim Burton was developing a movie based on the game at one point. Seriously, you'll be surprised how joyful it is to successfully body-slam a giant squid onto nuclear power plant. Aside from health management and some strategic play there is very little cognitive thought required beyond using your imagination to embellish on the movement of plastic figurines. There is, however, a degree of knowledge about the game that is required and this is the game's biggest problem. 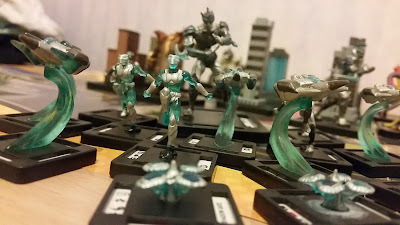 To add more strategy and variety to the game each figure (unit or monster) has an array of uniques powers and abilities, some activated by action, some by reaction to an attack and some by their combination with other figures. All these abilities are represented by little symbols that litter the bases of the figures. This amounts to a lot of cross referencing twixt base and reference book and the basic game only comes with one book filled with a largely unorganised index. This means the first few games played can normally end up with people frantically searching though endless lists trying to cross reference the book with their figures, while their opponent waits impatiently to have the book so they can begin planning their turn. Photocopying can give each player a copy of the list but the constant looking up of symbols slows the game significantly. Ultimately, reference cards for each unit/monster would have been far more beneficial and kept play much quicker but unless you're willing to put the time and effort into producing these yourself playing this game can be a slow and frustrating experience if you want to get the most out of it. 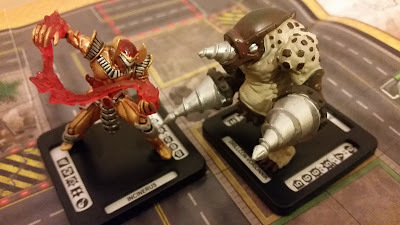 The figures are excellent and ring every ounce of goodness out of the Kaiju genre. Units are detailed and the buildings help create a 3D board to play on, even if the mat is only a fairly flimsy 2D print. The health counters are made of plastic and are easy to keep track of so it is only the lack of reference cards that is the weak link here. I found the game relatively easy to play and have been able to play a more stripped down version with my 9 year-old daughter quite easily. Its colourful and fun and you can adapt the rules to simplify it as much as you like. You can't really ignore the quagmire of cross-reference if you want to escalate the depth of strategising though. Monsterpocalypse is available in a starter set that comes with two armies (monster and units for each player) and enough buildings to mount a battle. You can then buy extra monsters, units, buildings and maps to add to the game and customise your army. This ups the cost but allows you to create an army to your own tastes. The drawback with this is that figures are randomly packaged, meaning that you can fork out £15 for a new monster and end up with one you didn't particularly want or, worse, one you already own. It is a real shame and actually hurts collectors. There are are third-party retailers that sell monsters unpackaged but, like the lack of efficient reference material in the base game, this seems like an own-goal and a barrier to enjoying would should be a fast moving and fun tabletop war game. There is a lot to like here but it does require a bit of extra work to get it up and running properly.